A line of Minis travel above the shop floor at BMW's Cowley plant in Oxford, U.K., in November 2013. The value of British car exports has doubled in the past 10 years, and Britain enjoyed its best-ever July for auto exports since industry records began in the 1920s. LONDON -- When Britain lost its last native car company 20 years ago, it was lamented across the political spectrum as a national catastrophe. "The sheer stupidity and immorality of this betrayal is too scandalous to be ignored," wrote a columnist in the conservative Times of London. The left-leaning Guardian bemoaned: "No one can conceive of Renault, Fiat or indeed BMW fattening themselves up after years of emaciation, ready for sell-off to a foreign rival." Britain's Rover was falling into the hands of BMW -- 50 years after Germany had begun pulling itself out of the economic abyss left by the Second World War. The blow to British pride was made all the more acute by the success of France, where Peugeot and Renault were speeding ahead. In 1994 French producers made more than three million cars, double Britain's output. Now, the tables have turned dramatically. Britain last year produced more cars than France for the first time in decades: 1.51 million to France's 1.46 million. The French retain a narrow lead when light vans are included, but Britain is set to pass them soon and become Europe's No. 3 after Germany and Spain. The value of British car exports has doubled in the past 10 years, and this year Britain enjoyed its best-ever July for automobile exports since industry records began in the 1920s. In France, meanwhile, government assistance has kept Peugeot afloat as both it and Renault lost domestic market share. "Car production in France has suffered greatly these past 10 years," France's new Finance Minister Emmanuel Macron told reporters at a presentation of Peugeot's compressed-air hybrid cars in Paris late last month. But the answer, he said, was more state investment, not less, in programs such as fuel-efficient concept cars and transmissions. "These are projects in which the French state has invested more than 400 million euros ($500 million) over the past three years, and we'll invest more in the next three years because we believe in them," Macron said. "We have everything we need to reclaim our lead over the U.K. in coming years." At the biennial Paris auto show this month, this tale of two car industries was especially on display. Though separated only by the narrow English Channel, their divergent fates stem in large part from a wide gulf in capitalist philosophies. Britain embraced free-market globalization, which -- while inflicting pain on workers and shareholders -- allowed under-performing native companies to fail and be bought by foreign-owned automakers. Nissan Motor Corp. and BMW are prominent among the buyers, and India's Tata Motors owns iconic British brands Jaguar and Land Rover. Native ownership and national pride have taken a back seat. "We benefit from openness," Britain's Business Secretary Vince Cable told Reuters. "A lot of the mythology around foreign companies -- that when they came here they would just gouge out a bit of intellectual property and run away -- was untrue. They have actually invested very heavily." France, a much larger land mass than the United Kingdom, industrialized more gradually and has hewed to a statist capitalism in which politicians heavily influence, and at times even dictate, major corporate decisions. French leaders through the decades have used the car industry to increase manufacturing jobs in formerly rural areas. Key to this is retaining French control, which was a core concern earlier this year when China's Dongfeng Motors, under French government strictures, took a minority stake in Peugeot and injected fresh capital into the ailing company. The French state itself has minority stakes and board seats in both Peugeot and Renault -- reflecting a culture of government involvement that extends well beyond the auto industry. America's General Electric Co., for example, had to agree to French government conditions including a jobs pledge when it acquired French engineering company Alstom earlier this year. Government guidance is widely viewed as the key to creating and keeping jobs. "There is a completely different approach compared to Britain," said Socialist lawmaker Francois Brottes, who heads the French parliament's economic committee. "The presence of the state is in no way a brake on growth -- it is a form of safety belt. It's crucial to have the state as a stable shareholder, whose needs are clear, who will be there in the long term even when times are tough." Even so, the diverging fortunes of both auto industries sharply mirror their national economies. Britain's recovery from the 2008-09 recession has been exceptionally slow by historic standards, but unemployment is now falling, inflation remains low and this year the economy is forecast to grow faster than any other major advanced nation. In France, the jobless rate stubbornly tops 10 percent, four percentage points higher than Britain's. In August, French manufacturing shrank at its steepest rate in 15 months and President Francois Hollande recently said the country will miss public deficit targets. 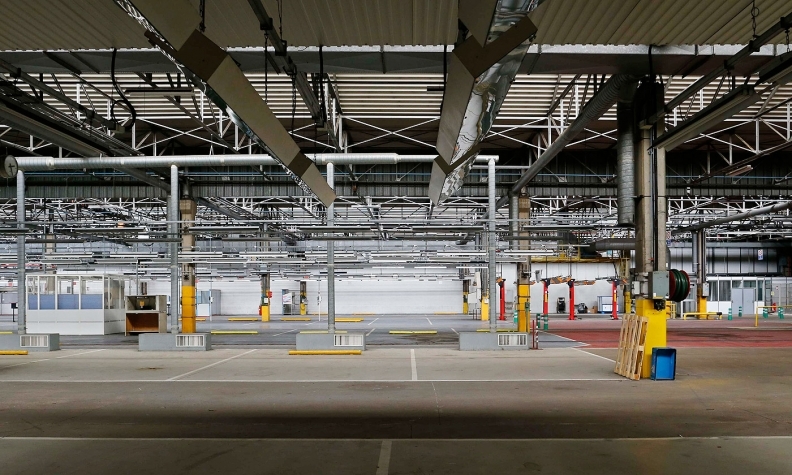 A car production building sits empty at the PSA-Peugeot Citroen manufacturing complex in Aulnay-sous-Bois, near Paris, in July 2013. In France and Britain, political and economic policies are wide apart, but the case against government involvement in the auto industry is not black and white. State intervention has clearly benefited carmakers in other nations. Five years ago, the American government mounted an $80 billion bailout and restructuring of General Motors and Chrysler Group. Now the industry is booming. That said, the U.S. bailout was an exception, not the rule as in France. Also, the U.S. government steered clear of board seats and management decisions, and didn't balk at passing control of Chrysler to a foreign company -- Italy's Fiat. Germany's auto industry likewise remains robust, and mostly German-managed and controlled. The German state of Lower Saxony's 20-percent stake in Volkswagen did not stop the firm becoming Europe's biggest carmaker thanks to fat margins in the luxury sector, although lower sales have recently hit profits. Whatever their differences, the British and French car industries have until recently had at least one thing in common: falling employment. Over the past decade, neither Britain's laissez-faire approach nor France's interventionism have managed to reverse a decline of more than a third in the auto industry's direct employment, to 161,000 and 201,000 jobs, respectively. In Britain, that has changed: Car industry employment is now rising. France's tough labor laws and heavy state presence are helping make Britain a more attractive place to invest, said German Arndt Ellinghorst, the head of automotive research at ISI Group. "[British] people have less of an attitude ... are equally skilled, they're willing to work harder and you have a government that is more likely to support you than chase your management away by taxing all their income," he said. "Give me a single reason why you want to produce anything in France?" One executive who knows all about French political pressure is Renault CEO Carlos Ghosn. In 2009, it emerged that he had decided to build most of Renault's latest model, the Clio 4, in Turkey, not France. It was the first time the automaker had taken such a step. One dark January evening in 2010 he was summoned to the residence of conservative President Nicolas Sarkozy to explain himself, the government said at the time. Ghosn eventually got his way, but had to promise future work would be given to French auto workers. Two years later, Hollande, the country's first Socialist president for nearly 17 years, was jolted by Peugeot's decision to shutter a French car plant. It was the first such closure in over 20 years, and symptomatic of the ailing economy. Hollande and his then-Economy Minister Arnaud Montebourg -- a left-winger who would become widely regarded as anti-business for interfering in decisions -- said they would save the plant. But after the extent of Peugeot's financial woes became clear, its fate was sealed: The plant, which employed around 3,000 people, produced its last car in October 2013. In contrast, when Ford Motor Co. decided in the same year to end a century of vehicle production in Britain, Westminster put up little resistance. Britain's business ministry saw the move as "regrettable but a commercial decision for the company." Its response focused not on saving the plant but ensuring workers found jobs elsewhere. Ford still builds engines in Britain. British ministers did intervene to save a Vauxhall plant in 2012, but it was painful concessions by workers -- including agreeing a two-year pay freeze -- that kept the factory open. Roger Maddison negotiated the future of both plants for Britain's biggest trade union, Unite, and told Reuters that no British government, left or right, would commit money to save any facility. "They won't do what the French government do. They won't give state aid because they'll tell you that they can't do that because it's against European law," he said. "I think that's possibly just an excuse not to give any money." European Union regulators gave France the go-ahead to a 7 billion euro state loan guarantee for Peugeot Citroen's financing arm in July 2013, but tightened the terms. 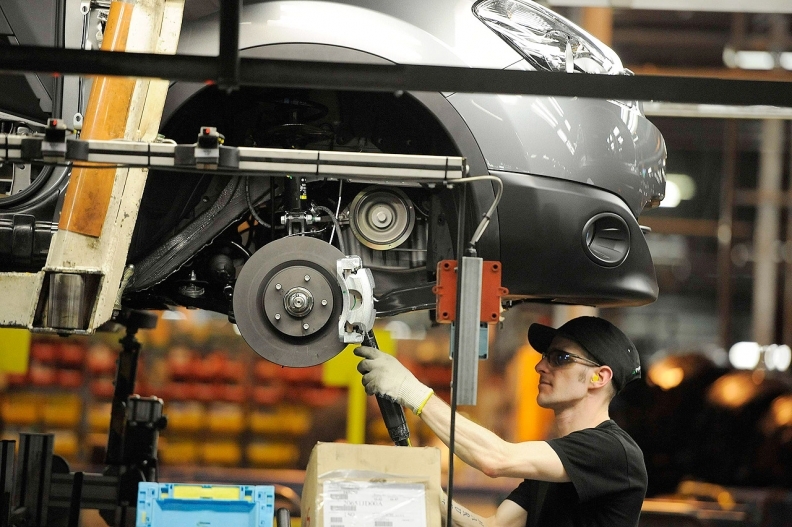 A Nissan technician helps assemble a Qashqai car at the company's plant in Sunderland, U.K., in November 2011. The factory is now the U.K.'s biggest car assembly site, building one in three of Britain's 1.5 million cars last year. Britain has certainly endured a long, painful struggle. In 1972, the country built a record 1.92 million cars. Eight years later that had halved to fewer than a million. It was a time of tumultuous upheaval. A major automaker was partly nationalized, thousands were made unemployed and hundreds of work days lost to strikes. Antiquated factories, bad designs, and increased foreign competition added to the headaches. By the time free-market stalwart Margaret Thatcher took office in 1979, the U.K. industry looked set to crash. But in 1984, two decisive moments helped turn things around. The first, the start of a bitter battle with Britain's powerful miners' union, ended in the union's defeat: Workers' power could be curtailed. France has had no equivalent moment. In the same year, Thatcher also signed a deal to bring Nissan to make cars in England's depressed north. No thought was given to a government stake, but the deal for the plant in Sunderland was helped by the government's offer of land at rock-bottom agricultural prices. As the 21st century opened, BMW briefly returned the rump of Rover to British hands. But sales kept falling and by 2005 MG Rover was sold to Nanjing Automotive of China. Fast-forward a decade and the Nissan plant, with its gleaming machines, robotic arms and widespread automation, is the country's biggest car assembly site, building one in three of Britain's 1.5 million cars last year. The 356,000-square meter (88-acre) complex is a far cry from the dirty, rundown 1970s plants. Conveyors transport the soon-to-be-car from chassis to completion, lifting it into the air for the engine to be fitted before testing. Today, British auto workers can be up to twice as efficient as their French counterparts, according to Bernstein Research. 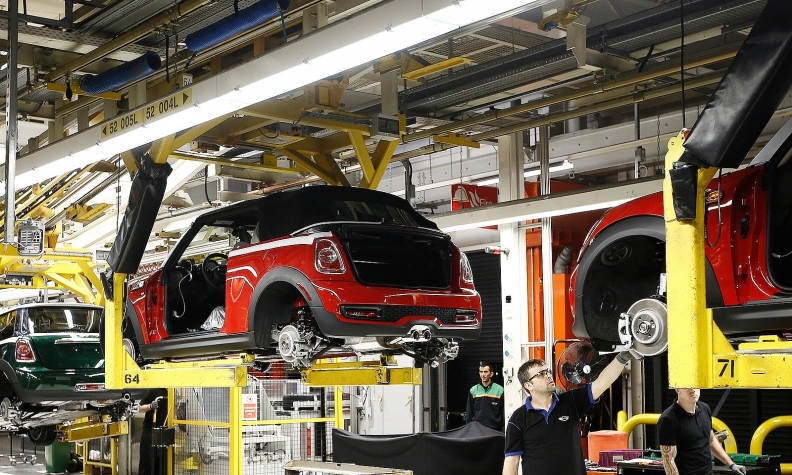 At BMW's plant in Oxford, England, each worker produced around 46 Minis on average last year compared with roughly 23 vehicles per PSA Peugeot Citroen worker at the Sochaux plant in France. Calmer labor relations in Britain have also helped. Car workers are still among the most unionized -- membership is around 85 percent according to trade union Unite -- but the wildcat strikes of the past are gone. In France, workers still take their bosses hostage. In January, workers at a Goodyear factory 'bossnapped' two executives as the firm tried to close the plant. And while the French see autos as a strategic industry which the nation must champion, for some Britons it doesn't matter who's in charge. At a West London dealership for Tata-owned Jaguar Land Rover, 62-year-old city financier and avid car collector Andrew Honychurch certainly isn't fussed. Eyeing the most expensive Range Rover on the forecourt, a gleaming 92,000-pound ($149,000) silver model with white interior, he believes employment is all that matters. "It's a British brand, it's British jobs," he says, as his wife and daughters peruse a long line of top-range models. "I'm buying a product that is designed and made here in the U.K. so the ownership of it ultimately doesn't bother me." That said, only around a third of parts used in British-built cars are locally made: The government has identified 3 billion pounds worth of production that could be repatriated. British Business Secretary Cable is pleased with foreign investment in the U.K. industry. But Britain's investment in research and development -- including on vehicle, engine and diesel technology development -- totaled 1.9 billion pounds in 2013, according to the Society of Motor Manufacturers & Traders. That was over a billion pounds less than France's total spend. The French argue that national ownership has kept investment strong, which underpins the longer-term prospects of French automakers. "Be it the two main national manufacturers or the equipment suppliers, they have made it clear they are trying to keep a large part of their r&d strength in France," said Bernard Million-Rousseau, director-general of auto industry group PFA and former Peugeot executive. "I don't see how that penalizes France -- quite the contrary."